March is Women’s History Month. There is a great deal to celebrate about women’s history…including women’s work on the land. However, we have so much more work do on that front, including getting more women farming. This means increasing access to land, capital and education. A group of women who worked in agriculture 100 years ago – members of the Woman’s Land Army – remained largely invisible for decades. Yet, they used their work on the land to press for suffrage, equal wages and more. 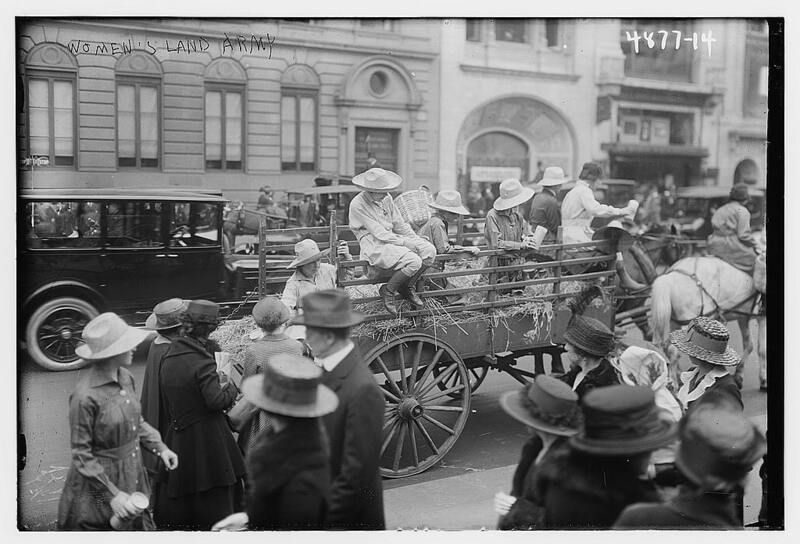 This happened during World War I, when nearly 20,000 women – many of them urban and suburban college coeds – enlisted in the Woman’s Land Army of America (WLAA). Their goal? To help on the “farm front.” The program in the U.S. was modeled after programs in the U.K. and Canada. Herbert Andrew Paus (1880-1946). Library of Congress. The Woman’s Land Army would likely have never come into existence in America without an earlier effort: an obscure horticultural school for women in Philadelphia that served as a catalyst for the creation of this land army. Humble in its beginning, the Pennsylvania School of Horticulture for Women proved to be of national importance in subsequent years. Located in Ambler (the site is now the Ambler campus for Temple University and home to one of the nation’s leading landscape programs) women’s work there there drew national and international attention. Elaine Weiss has written an important book about the Woman’s Land Army during World War I: The Fruits of Victory. It provides a lively account of the program and the era and is well worth reading, especially as we enter the rolling centennial commemorating World War I. To learn more about the Pennsylvania School of Horticulture for Women, check out Sowing the Seeds of Victory: American Gardening Programs of World War I. In addition to discussing the work at Ambler, this book includes a brief history about professional women horticulturalists, devotes a chapter to the Woman’s Land Army and shares how women supported the war effort on the food front during World War I. Included in its rich collection documenting women’s history, the Library of Congress has taped a 39-minute talk (2005) by James Beard award-winner Laura Schenone. It’s entitled “A Thousand Years Over a Hot Stove: A History of American Women Told Through Food, Recipes and Remembrances.” You can read the UC Food Observer Q&A with Laura Schenone here.